Since its beginning, a key goal of Dynamics Days has been to promote the participation and cross-discipline interaction of young scientists together with more established experts from a wide variety of fields. The meeting is deliberately structured to encourage active participation from young scientists through both invited and contributed oral presentations and poster sessions. Now, the Special Issue of JPCS is on-line. See here. 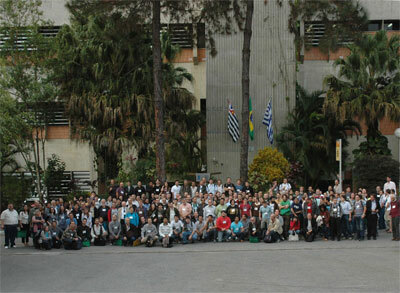 Now, the extended abstracts of the works presented in the conference are available here. Now, the attendance certificate is available here. All the plenary talks will be broadcasting through the internet. Service is provided by RNP, from 8:30 to 11:00 and from 14:00 to 19:00 through all the event days (July 27 to July 30). Copyright 2008© INPE - Instituto Nacional de Pesquisas Espaciais. All rights reserved.